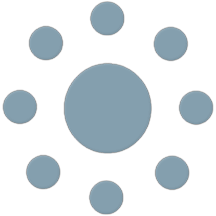 Hubski is a social network and link-aggregating service that has built a strong and growing community. They have accomplished this by promoting thoughtfulness and providing an enriching environment for discussion. Over the past two weeks, several Hubski users (e.g., JakobVirgil, rozap, theadvancedapes) have conducted studies to better understand the current state of Hubski, and potentially offer the creators with some useful advice for future growth. In this study, I will be building off of Hubski Report #1 (Quantifying Thoughtfulness: Relationship between important Hubski user data reveals comment popularity rank misrepresentation). In that study it was discovered that there was a significant correlation between badge total, follower total, and popularity rank. However, there was no significant relationship between comment rank and badge total, follower total, and popularity rank. 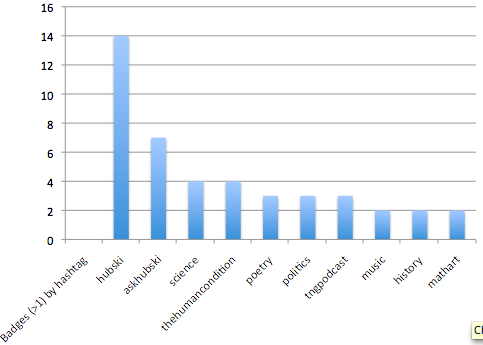 These data suggested that most popular commenters, and consequently, likely the most thoughtful contributors to Hubski were not properly ranked. It was suggested that this could create a few issues in the future, namely: a) new users would not have a database of the most thoughtful commenters; b) individuals that do not comment often will likely have a higher overall comment popularity rank, than those who comment frequently and have been members for a long time (Last, 2013). However, creator of Hubski, mk, also noted that the current comment rank system was designed to be dynamic in order to promote diversity and avoid reinforcing popularity among an exclusive and static group. I countered by pointing out that some of the highest rated commenters were new users that had only commented a few times, and therefore, did not deserve to be ranked higher than those who had thoughtfully contributed to Hubski for a prolonged period of time. We both agreed that some middle ground could be reached and that a future study on the frequency of badges for posts compared to comments should reveal some insight into what comment rank system would work best for promoting thoughtful discussion on Hubski. In this article I will attempt to better understand what Hubski has traditionally deemed “badge-worthy” in order to gain insight into the types of content users of Hubski find thoughtful. These data should help us gain perspective on the current comment rank system, but will also be useful in understanding other past trends, most importantly: what does the thoughtful social network think is thoughtful? This will be done by aggregating data on total number of badges, badges for posts vs. comments, badges by hashtag, badges for external vs. internal posts, and badges by comments <250 words vs. comments >250 words. Data were collected on January 12th, 2013 between 12:01 A.M. EST – 11:30 A.M. EST) from hubski.com/badgesubs. Data collected were publicly available, and notification of this studies progress was given to mk. Data were charted using excel and generated into a word cloud using wordle.net. 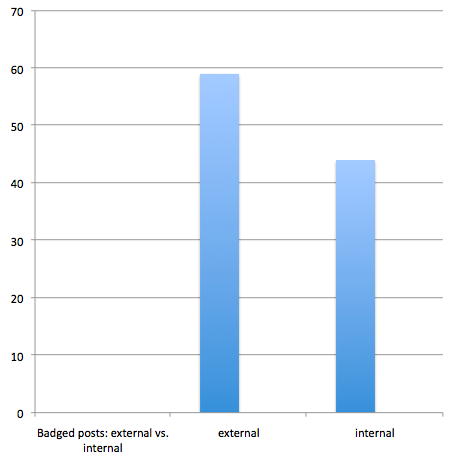 Significance between badges for Hubski-related posts vs. other posts were tested using Wilcoxon-signed rank test and run on SPSS (Statistical Package for the Social Sciences). 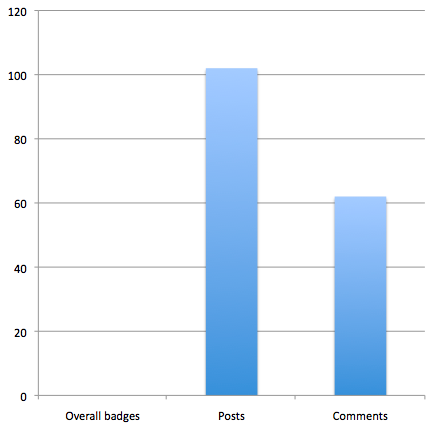 Of the 165 badges calculated 102 were given for posts, and 62 were given for comments (Fig. 1). Of the badged posts, 59 were for external posts (i.e., redirected from Hubski.com), and 44 were internal posts (Fig. 2). And of those posts 27 were Hubski-related and 68 were unrelated to Hubski (Fig. 3). There were also a distribution of badged posts by hashtag. #hubski had the most with 14, #askhubski had had the second most with 7, #science and #thehumancondition had 4, #poetry, #politics, #tngpodcast had 3, and #music, #history, #mathart had 2. Hashtags with only 1 badge are not shown (Fig. 4). Figure 5 represents these data in word cloud. Wilcoxon signed rank test was use to determine if Hubski-related hashtags were significantly badged more than other-related hashtags. Although the mean Hubski-related hashtag was higher (Fig. 6), there was no significant difference (Z = -.406, P = .684) (Fig. 7). 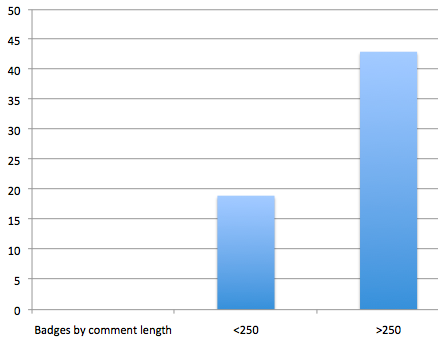 Finally, data revealed comments >250 words were badged 43 times, and comments <250 words were badged 19 times (Fig. 8). These data reveal that posts on Hubski are badged at a higher frequency than comments. Whether this is desirable or not is dependent on subjective interpretation. 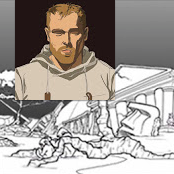 However, it is important to consider the discrepancy in badge distribution when designing the future of the Hubski experience (i.e., is this a place to share posts, or discuss interesting things?). Also, although most posts badged were to external sources, a large proportion were also to internal text posts on Hubski.com. This suggests that Hubski is also becoming a place to share more personal, introspective content. In terms of content, Hubski seems to reward content that is Hubski-related. Although only 8 hashtags were Hubski-related, they comprised 27 of the badged posts. A considerably higher mean (3.3750) than for other-related hashtags. It is important to note that the two most frequently badged hashtags were #hubski and #askhubski. 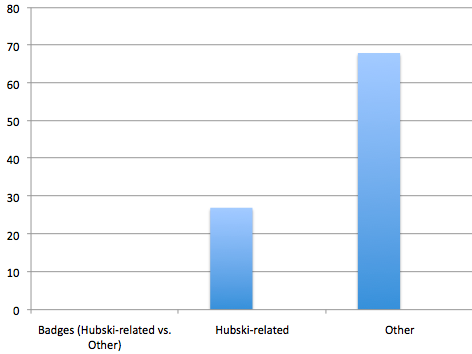 These data collectively indicate that Hubski enjoys content that is focused on community building. It would be interesting to see if this trend increased, or decreased over time. Of the content that was not Hubski-related, Hubski seems to most frequently reward content related to #science, #thehumancondition, and #poetry. It would also be interesting to see if there are changing trends in general #hashtag popularity. Finally, one of the strongest statistics indicate that comment-length is really a powerful determinant for badged comments. Overall, these data do shed light on some powerful internal dynamics of a growing online community. Whether the current comment popularity rank system is promotes badging comments or posts, seems to still be dependent on subjective interpretation. However, it is important to consider the fact that posts get rewarded substantially more than comments do. It is also important that the community realize some of the trends developing from the Hubski-reward system. The community appears to be developing into a group that enjoys bonding over Hubski-related content. But also, the community seems to deem endeavors like #science and #poetry, to be the most thoughtful. Future research to determine if these trends continue or change, will be useful to better understand how this community develops and how we should promote Hubski in the future. If you would like to contact Cadell Last you can find him on Hubski (username: theadvancedapes), or contact him via email (cadell.last@gmail.com) or on his website (www.theadvancedapes.com). Data (in excel spreadsheet format) is available upon request. Last, C. 2013. Good Job: What Does Hubski Badge? Hubski Report (Hubski.com), 2: 1-6.